Monday morning bright and early – 7:30 am we gathered with our host families one last time for Mass and tearful goodbyes. We loaded our bus with sandwiches, treats and the largest box of Polish baking you could imagine and headed off for our visit to Jasna Gora. Jasna Gora is the name of the historic monastery that towers over Czestochowa, the heart of which is the Sanctuary of Our Lady Queen of Poland. 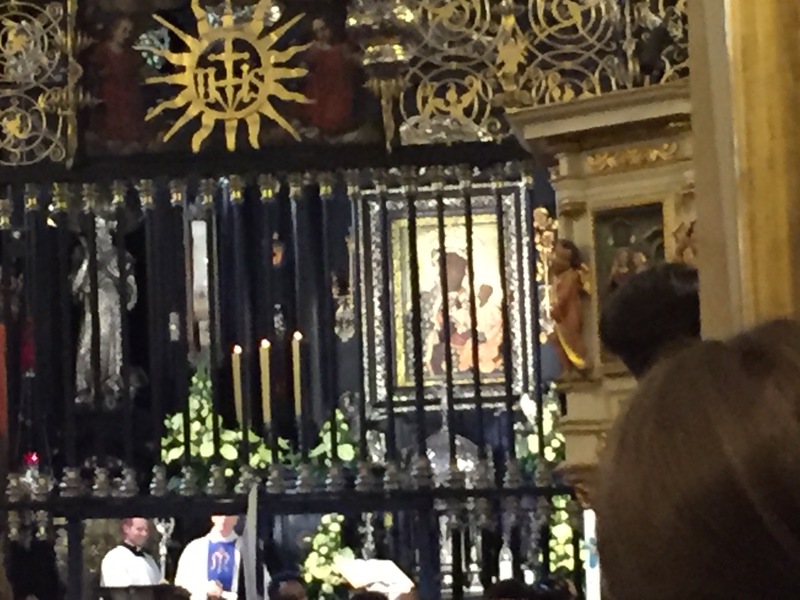 For more than six centuries, the miraculous image of Our Lady with the Child Jesus had been worshipped here. According to legend, the author of the icon is St. Luke the Evangelist. The Portrait of the Mother of God was believed to be one of several paintings made from the table top at which the Holy Family ate. 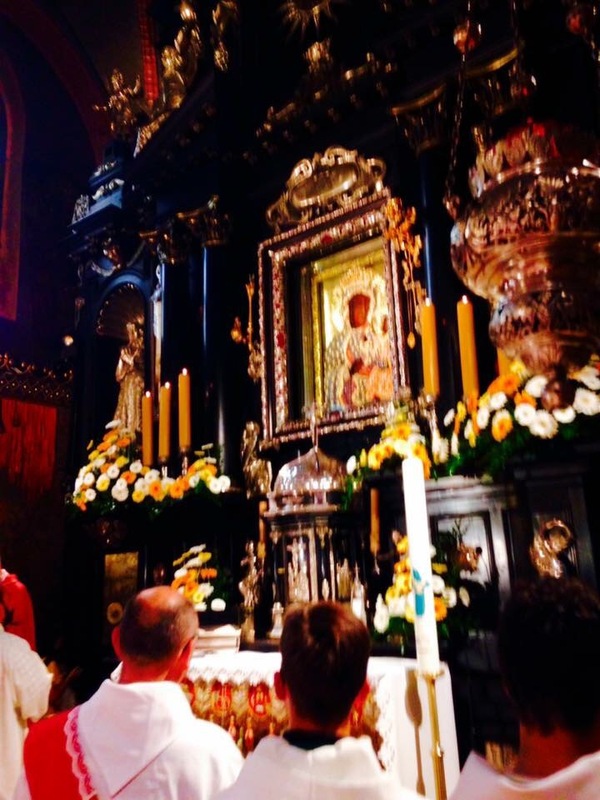 In the 20th century, Our Lady of Jasna Gora came to be called the Black Madonna due to the dark shade of the face of the Mother of God in the image. The crowds were massive! Groups from every corner of the globe descended on this shrine in hopes of venerating the image. It is a beautiful sanctuary! Many of us managed to squeeze in to the celebration of the English Mass. Mass is said continually throughout the day – it was unbelievably hot and at times uncomfortable but a great celebration. 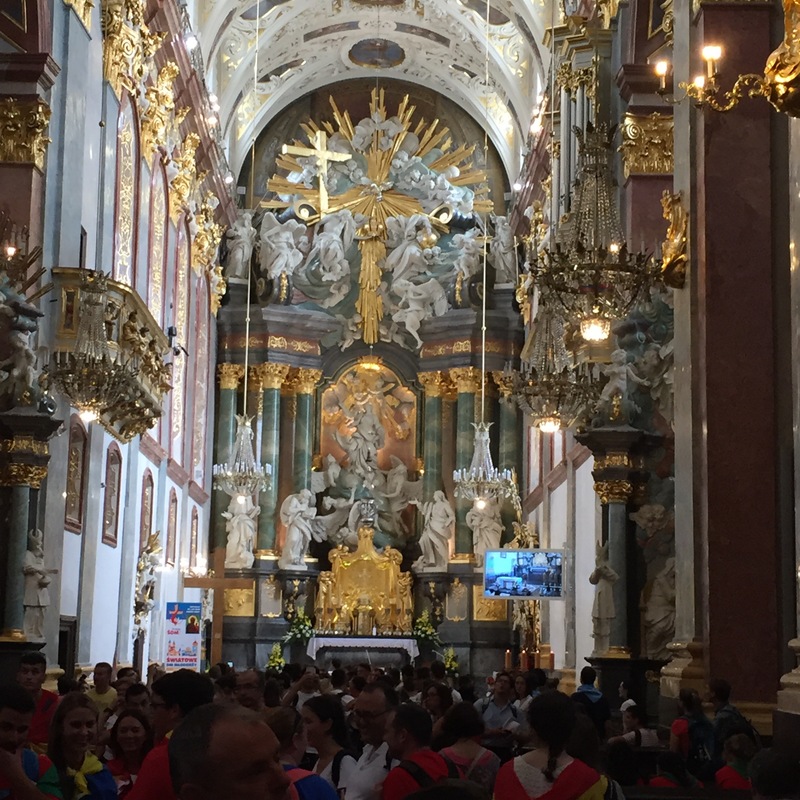 We spent just over three hours visiting the site and exploring the area…..and then back on the bus for the final leg of the journey to Kraków . The drive was just over two hours in very slow traffic with all the busses making their way to Kraków. We did make on more “rest stop” where Fr Kuzma and the gang took the opportunity to exercise. Upon arrival at the Seminary we were warmly welcomed by our hosts…..enjoyed a light supper and retired to our rooms. We are here!